The Mercedes-Benz BiTurbo engine does not use the typical intercooler you may be familiar with. Like many modern turbocharged European vehicles, this V-8 twin turbo engine uses coolant to lower the intake air charge temperatures through an air-to-water heat exchanger. While this method works well, it can quickly become heat-soaked robbing your engine of horsepower. 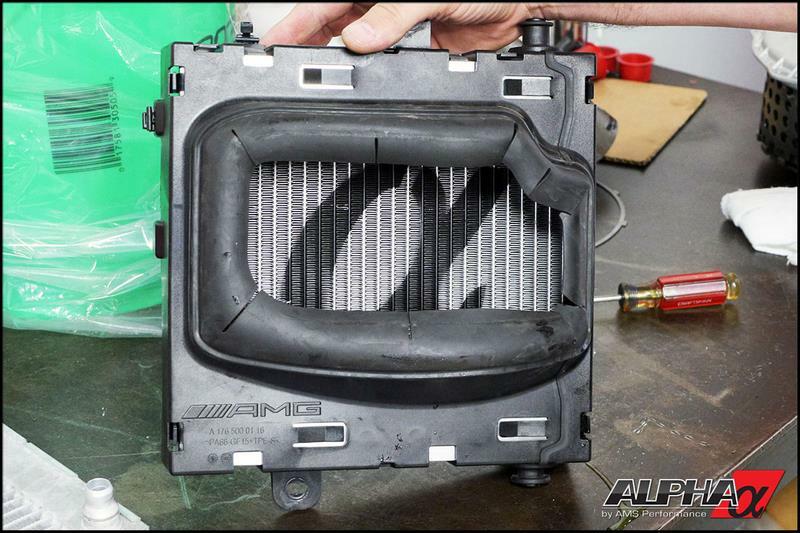 Although adequate under normal driving conditions, the stock heat exchanger system (responsible for cooling boosted air) underperforms when your E63 or CLS63 S-model is driven aggressively, in warmer climates or when subjected to extended periods of operation. 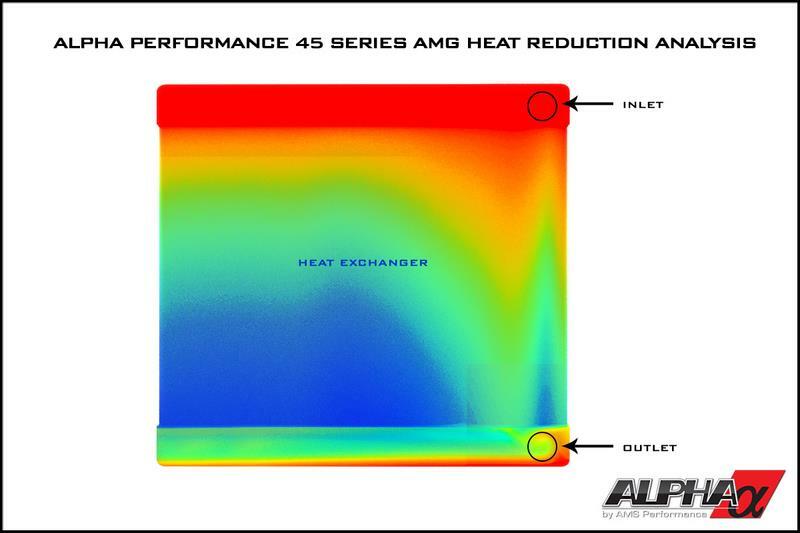 Whether you are running stock or upgraded components on your M157 turbocharged engine, the Alpha Performance Mercedes-Benz 5.5L BiTurbo S-Model Auxiliary Heat Exchanger Upgrade offers greater efficiency – providing cooler boost temperatures while combatting heat soak issues. 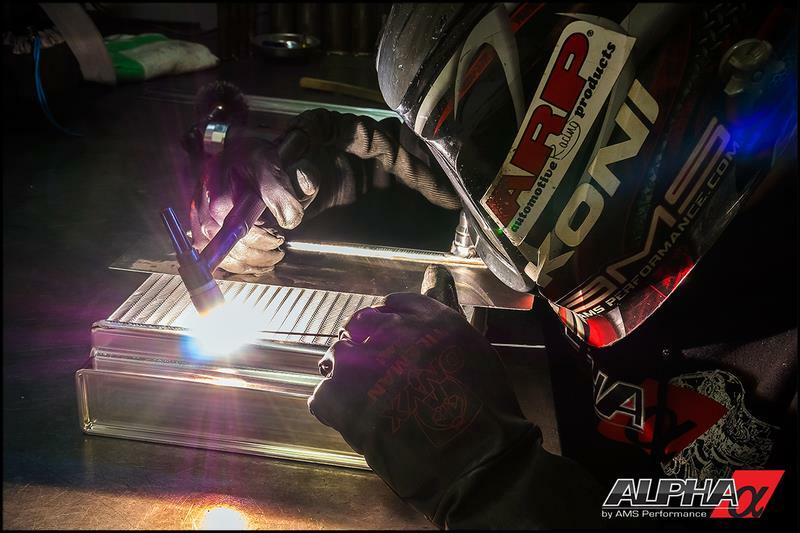 Beneficial throughout everyday driving, this level of cooling is even more crucial to consistent performance on a road course or dragstrip. 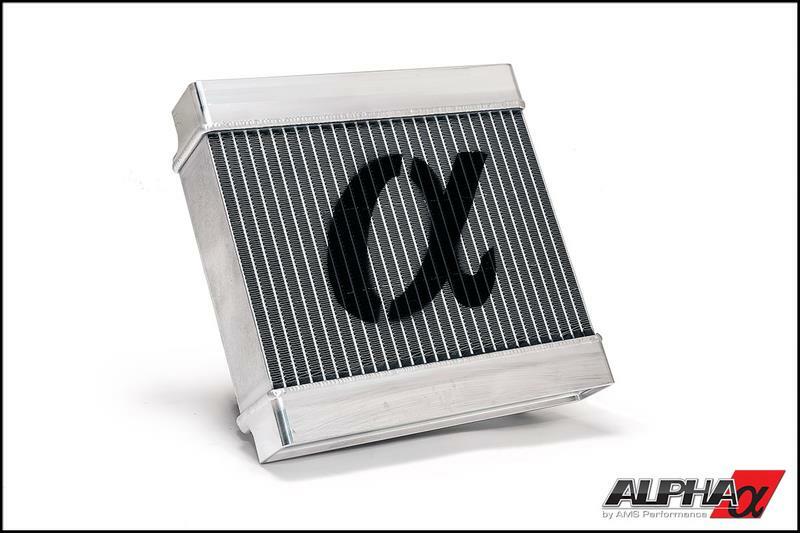 An upgrade to the factory auxiliary heat exchanger in both overall size and efficiency, ours offers better cooling of the intercooler system fluid. Being 38% larger than stock, our heat exchanger core provides additional liquid capacity for greater heat dissipation. This allows the system to maintain lower fluid temperatures throughout extended periods of high throttle operation. To improve flow and reduce pressure drop, our engineering team went a step further by tapering the inlet and outlet for smoother flow. All of this will result in cooler intake air charges. 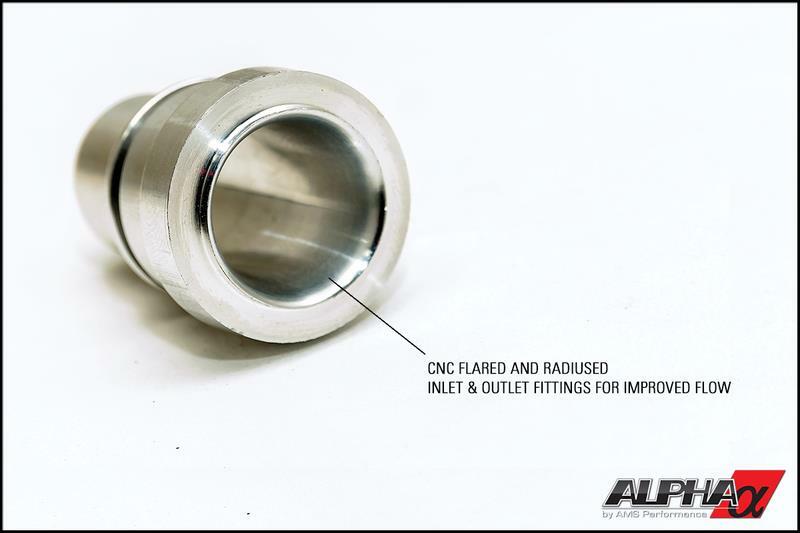 While the coolant inlets that mate to the Alpha CNC billet end tank use the factory hose fittings, we made the inside diameter larger to increase the flow rate. Also, the inside of these fittings flare out creating a nice flow path for the water increasing effectiveness. Our Engineering Team set out to make this auxiliary heat exchanger upgrade not only more effective but simple to install. It fits just like stock without any cutting or drilling. By using the factory lines and mounting points the core simply slides in locking into the factory mounts and gets connected to your existing factory lines. You don’t get a cleaner installation than that! 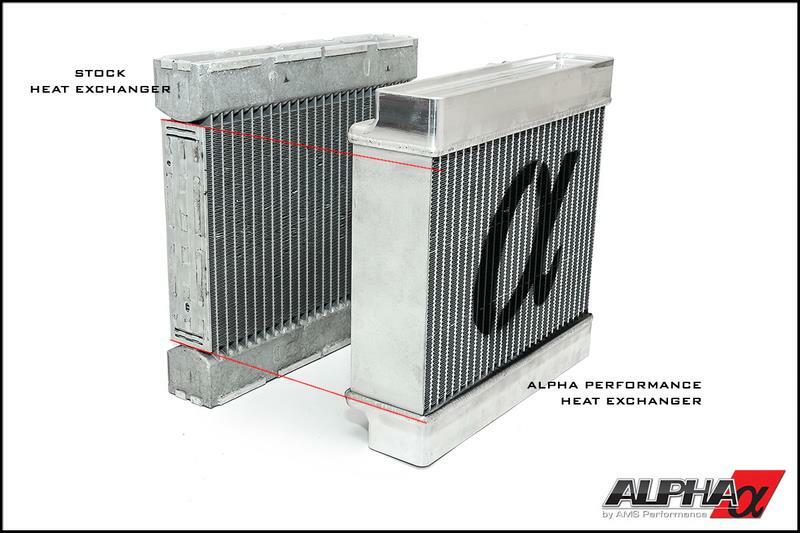 Although the Alpha 5.5L BiTurbo AMG S-Model Auxiliary Heat Exchanger is an effective upgrade, it is best to use in conjunction with the Alpha 5.5L BiTurbo Primary Heat Exchanger Upgrade or the total Alpha Boost Cooler System. This is a great addition to a stock car up to a Alpha 7 or Alpha 9 package.